Pepi Bath for the iPhone/iPad is FREE again today. 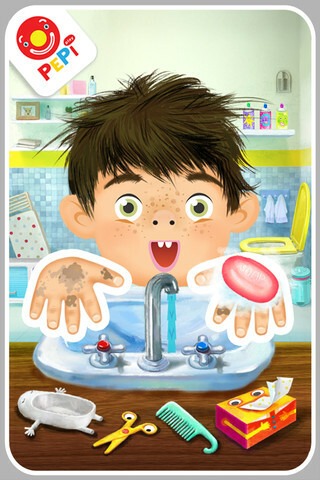 This educational app is a role-playing game that teaches kids (ages 2 – 6) about personal hygiene. Kids start by choosing the boy or girl character. Then they choose one of 4 situations: brushing teeth, taking a bath, washing clothes, using the toilet. In each scene kids learn to take care of themselves and they have fun along the way – popping bubbles, playing with rubber duckie in the tub, etc. There are also some good lessons built into the app. For example – when the scissors are chosen, the character shakes his/her head no. Also, the characters are VERY polite – always saying thank you! Check it out for some good clean fun!